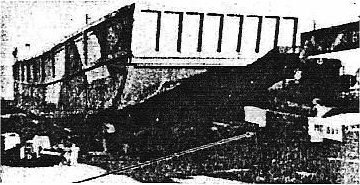 49'2" by 11'10" by 1'9"
The Moku Daihatsu or 15m landing craft resembled the Allied LCVP, with a bow ramp that was lowered on hitting the beach. Unlike other Japanese landing craft, the Moku Daihatsu had a wooden hull, constructed of 0.4" (10mm) 5-ply plywood on oak frames and floors, thereby economizing on scarce steel. The hulls were weak and the wood quickly decomposed in the tropics, so that the craft were relegated to logistical support in calm waters. The Navy ordered 1140 of these craft, but it is not known how many were actually completed.